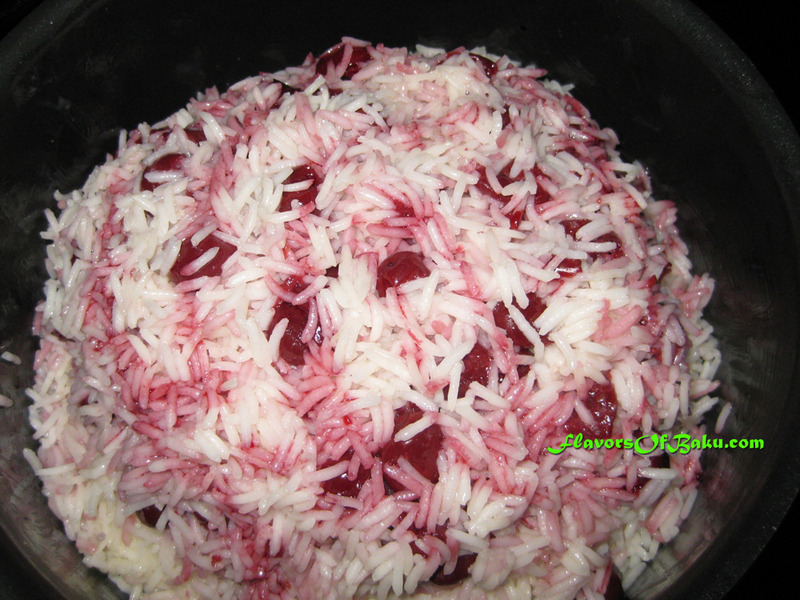 ALBALOO PLOV – Pilaf with Sour Cherries. 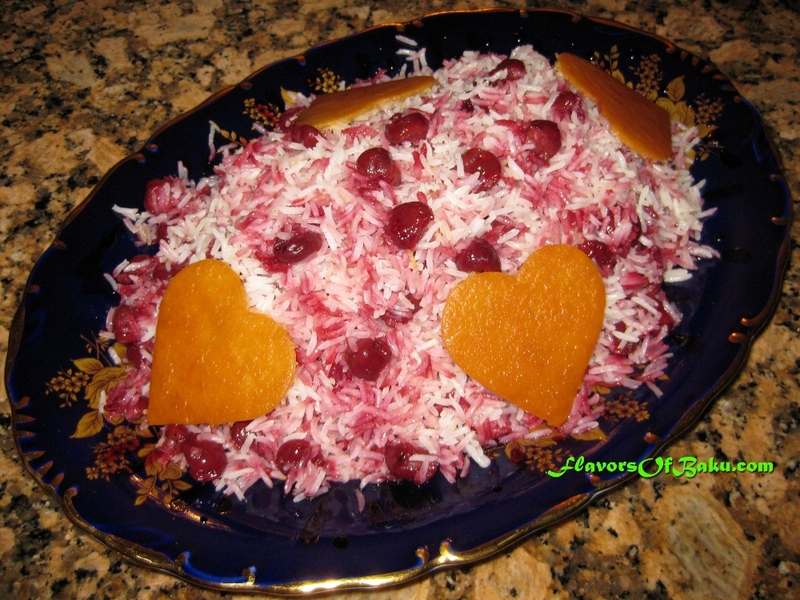 Pilaf with sour cherries is a Persian dish called “Albaloo Polo”. It is a delicious combination of sour cherries, rice and saffron. Rinse the rice thoroughly in cold water several times to remove excess starch. Then, soak the rice overnight in salty water for a truly great, fluffy, and tender pilaf. Soaking the rice for any less than overnight is a waste of time, but if you are using extra long, high quality Basmati rice and don’t have the time to soak the rice, you can skip it and only rinse your rice right before cooking. To prepare the infusion, take a ½ teaspoon of dried saffron threads and toss them into a glass. Then, pour two tablespoons of boiling water and let it sit. Immediately, the water will turn an opulent yellow color, deepening over the next few minutes until it becomes a clear, bright orange. For this pilaf, you can use either fresh or frozen cherries, or canned cherries in syrup. If you are using fresh cherries, they need to be pitted. Place the pitted sour cherries in a pot and add the sugar. Give it a gentle stir and simmer on medium heat for 15 minutes. 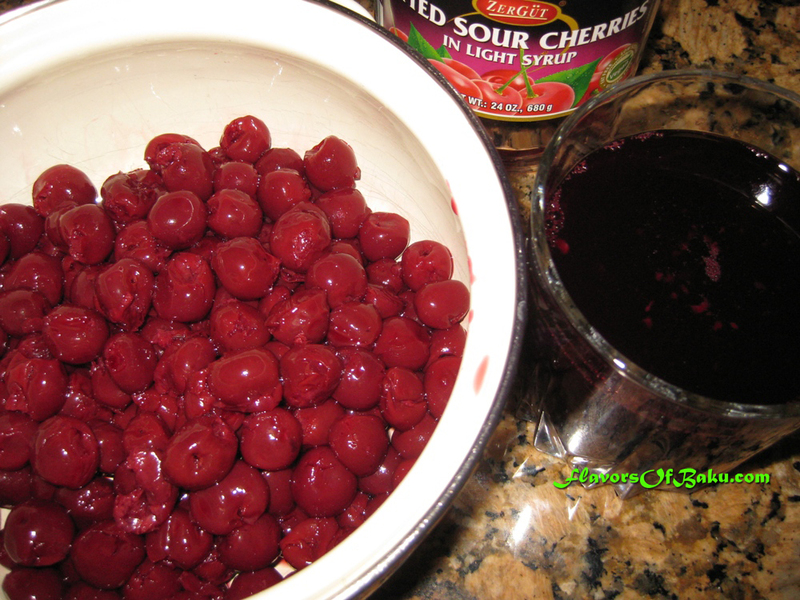 If you are using canned cherries, you need to separate cherries from syrup. Drain syrup into a pot, add sugar and simmer until syrup is slightly thickens. Pour ½ cup of syrup over the cherries. Fill a saucepan with water, add salt and bring it to a boil. Place the rice into the boiling water. Stir, lower the heat to medium, and let it cook for 7-10 minutes. Do not overcook your rice! It must be hard on the inside and soft on outside. Strain the rice using a colander, rinse it with hot water to wash out any extra salt, and set it aside. Melt the butter in a clean pan over medium heat. Gently mix in the bowl sour cherries with the rice. Pour two tablespoons of melted butter into saucepan and place lavash (tortilla) on the bottom. Lavash will prevent the rice from scorching and form a crispy, delicious crust named Qazmaq. Place a layer of the cherry-rice (approximately quarter) on lavash and pour three tablespoons of hot melted butter on this layer. Then, place another layer of rice on top and follow up with more butter. Repeat the procedure with all your rice. On the last layer, pour the rest of the syrup (leaving 1 tablespoon for coating your chicken), melted butter and a saffron infusion. Make some air holes in the surface with the handle of a wooden spoon to allow steam to escape. Wrap a lid of the pan in a clean tea towel and cover. Cook over a very low heat for 45-60 minutes. 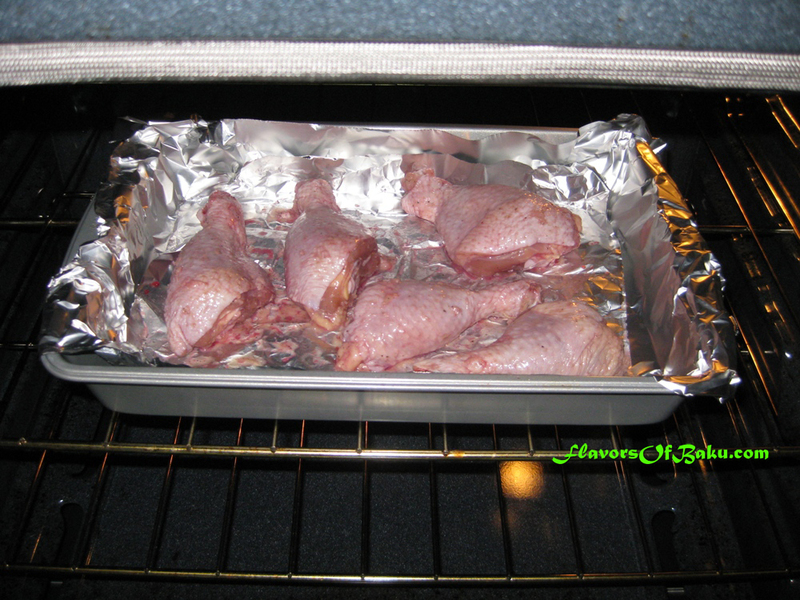 Chicken drumsticks (or any other parts of the chicken) season with salt and pepper. Brush with butter and cherry syrup and bake in the preheated oven at 350F (180C) degrees until golden brown. 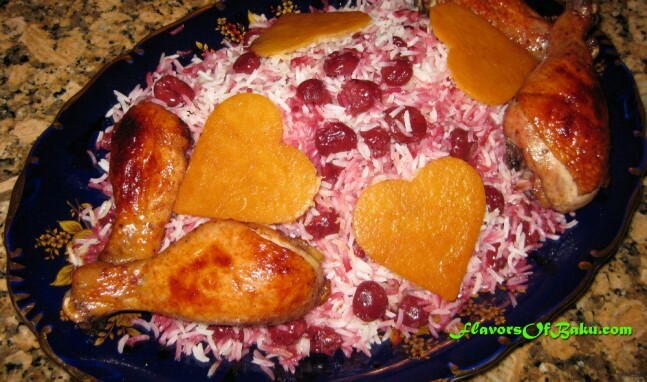 Serve Albaloo pilaf on a large plate and garnish with qazmaq and chicken.